JENNIFER CUNNINGHAM INSURANCES offers a wide variety of insurance policies in Spain including car and other vehicle insurance, home and buildings contents insurance and policies for travel, health, pets, funeral and much more. They offer multiple payment options, including bank transfer, direct debit and credit / debit cards as well as various discounts and extra discounts for multiple policies. Contact Jennifer Cunningham for more information  they are more than just a voice on the phone. 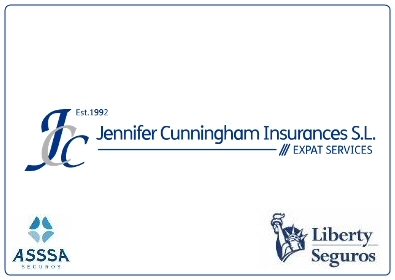 Jennifer Cunningham offers competitive car insurance policies in Spain with Liberty Seguros especially designed for the expat market. They even insure UK registered cars. Car insurance in Spain differs from what many of you are familiar with from the UK. For example, in Spain one insures the vehicle as opposed to the people who are going to drive it. It is mandatory to insure your car under Spanish law (even if it is off the road). Jennifer Cunningham are also one of the few agencies able to offer classic car insurance. Jennifer Cunningham is able to offer three competitive levels of Home and Contents insurance and will even cover an amount of water lost due to damaged pipes. The policies have been designed especially for the expat market. The Spanish National Health Service is probably better than that available in the UK but has certainly come under mounting pressure in recent years due to the high level of immigration and the increasingly severe economic conditions still being experienced worldwide. Private health care enables clients to access medical procedures without delay and, with a full-time bilingual administrator to assist with their clients, their relationship does not end with the setting up of the healthcare plan, it begins. Jennifer Cunningham Insurances also offer policies for life insurance and for holiday homes, travel, commercial, community, golf, pet, marine, landlord, static home and mortage protection as well as bespoke insurance options. Making arrangements for their own funeral is an uncomfortable topic for some people, but no less of a necessity. Jennifer Cunningham helps make sensible, planned arrangements to protect those closest to you at what will be a very difficult time. Jennifer Cunninham has selected professionals to offer regulated sound advice on legal matters such as wills, conveyancing, divorce, etc., financial advice with free consultation on such matters as pensions and tax, mortgage advice and regulated currency exchange. Please mention javeamigos.com when dealing with Jennifer Cunningham Insurances.